Jennifer Heddle is the Executive Editor for fiction at Lucasfilm. 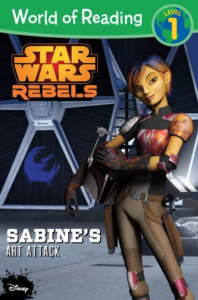 In addition to her work as an editor, she has written three Star Wars young reader books – Star Wars: A Leader Named Leia, Star Wars Rebels: Ezra and the Pilot, and Star Wars Rebels: Sabine’s Art Attack. Heddle was kind enough to answer a few questions via email for 365 Days of Star Wars Women. How long have you been a Star Wars fan and have you always read Star Wars books? I’ve been a Star Wars fan since the first movie came out in 1977. I was four years old when I saw it and was instantly obsessed. I was likewise obsessed with the novelizations of the original trilogy, so in that sense I have been a fan of Star Wars books my whole life! I read the original novels that kicked off with Heir to the Empire for a few years, but eventually fell off from them, which enabled me to look at the program with fresh eyes when I was hired. Anyone who follows you on Twitter knows you are a big Leia fan. Why is she such a special character to you? She’s the reason I’ve never thought that girls couldn’t do everything. Her fire and determination made her a guiding role model throughout my life. I think what I treasure most about the character is her strength despite everything she has endured. She has her vulnerabilities and her weaknesses and her deep losses, but it never stops her from doing what needs to be done. Your current title is Executive Editor for fiction at Lucasfilm. Is it correct that includes books, comics, and roleplaying games? When I first started at Lucasfilm I handled all adult fiction, which included books, comics, and roleplaying games. My role has since shifted to be all book fiction, from kids to YA to adults. Another editor works with Marvel now, but I still love reading the issues. There are so many Star Wars related books out there can you give me some examples of publishers or projects you have been working with recently? I think there is a lot of confusion about Star Wars books since there are so many publishers and imprints and I’m hoping to understand the overall structure a bit more. Our structure can definitely seem confusing! There are five editors, including me, under our creative director Mike Siglain. Most of what we do is work with our licensee publishers by helping develop concepts, assisting them with resources, and reviewing and approving material at all stages of the publishing process. I work with Del Rey on the adult novels of course, as well as Quirk Books on the Shakespeare Star Wars titles, Scholastic on the Jedi Academy series, and all LEGO Star Wars, among other things. In addition to my work with licensees, I also acquire and edit middle grade and YA fiction for our “in-house” imprint, Disney Lucasfilm Press. For those titles I am an editor in the traditional vein, working directly with authors and agents. You came to Lucasfilm in 2011 as Senior Editor of LucasBooks, a few years before the EU become known as Legends and the new Star Wars canon was announced. How early did you know this change was going to happen and how do you think it’s going so far? Do you still work with Legends titles? From what I remember, I knew not too long before the news went public. Legends material is still being published in countries outside the US where Star Wars is newer to them, but we are probably going to be winding that down too now that there is so much canon material out there. We don’t want to confuse people. Can you give me an idea of what you might be doing for your job on an average day? E-mails, e-mails, e-mails! I come in every day to a slew of e-mails from publishers, Disney publishing folks, authors, etc, and everyone needs something different. I may have to request visual reference from an upcoming film from an author, or approve cover copy from Del Rey, or approve the design of a French edition of one of our books, or pass along continuity questions I can’t answer to the Story Group. We Lucasfilm editors are the hub for many different publishers and we have to make sure that everyone has what they need at all times. When I’m very lucky I get to actually read and edit manuscripts! What has been your favorite project you’ve worked on since you joined Lucasfilm? Oh wow, I don’t know how to answer that question! Well, everyone knows I love Leia so obviously Bloodline and Leia: Princess of Alderaan by Claudia Gray are very special to me. 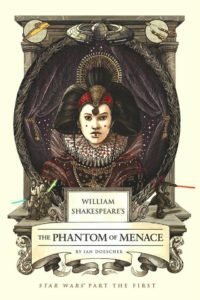 But to give a non-Leia answer I will mention the Shakespeare Star Wars series by Ian Doescher, which is so incredibly well done. When Quirk first approached us with Ian’s work, I was the one who really advocated for it here and I’ve been thrilled to see it be such a success. In addition to your work as an editor, you have also written several Star Wars books. How did that come about and do you have a favorite book you have written? Any books you would like to write in the future? How far do you plan out books for the Star Wars universe? What’s the average time between when you or someone else comes up with an idea for a book and readers are able to buy the book? A lot of what we do is obviously bound to film schedules and to various franchise priorities so we have to be nimble! I’d say right now we’re figuring out our slate for early 2019 and beyond. Can you give me a sense of when Star Wars fans can expect more book announcements? Is there a woman from the Star Wars universe you’d love to see get her own book? The easy answer is all of them! Stay tuned. Are you ever surprised with what book or comics Star Wars fans don’t connect with? One of the truths about publishing is that you can never completely know if readers will connect with a book or not. So when they don’t it’s not so much a surprise as an “oh well.” You always hope everyone will love everything, but that is never going to be the case. For women and girls reading this who want to break into publishing what advice would you give them? Unfortunately it seems like you need a higher degree or some kind of publishing course on your resume these days to break into book publishing, which was not the case when I got started. So I think the best practical advice I can give is to not hold out for what you think is your dream position. If you want to be an editor but there’s only a marketing position available, take it. If you want to be an agent but there are only positions available at publishers instead of with agencies, do that, and vice versa. It’s about getting in the door, making contacts, and being around books. My first publishing job was as a marketing assistant for library reference books. You can find Jennifer Heddle on Twitter @jenheddle .